How to use Exchange ESEUTIL tool? 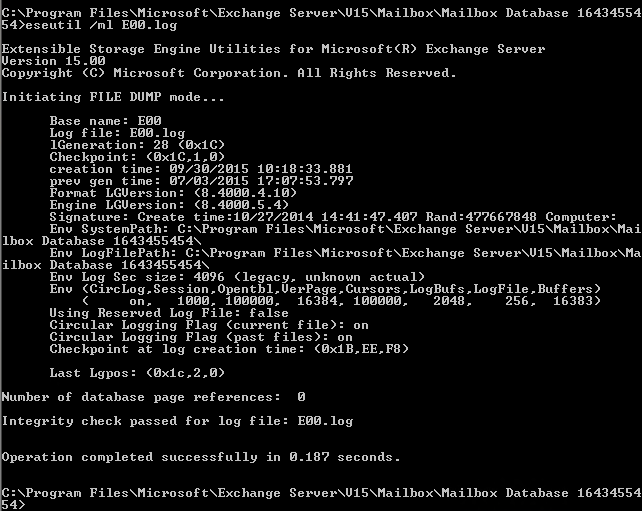 How to use Exchange Extensible Storage Engine Utilities (ESEUTIL) tool? ESEUTIL is an Exchange tool that is well known among administrators as it accompanies them since the era of Exchange 4.0. It was proofed to be tremendously useful for a variety of purposes, e.g. for fixing corrupted databases, defragmenting them, reducing their size or checking their integrity. Sometimes it is a matter of time, when the administrators are faced with the problem of a server failure with the Exchange installed on. The failure may be just the temporary power cut-off but it also may turn to be something serious. No matter what the reason is, when you manage to get the server up again it may come out that the .edb file has troubles to mount and shows the status called Dirty Shutdown. The same may happen when you attempt to recover a backup file. In those scenarios, ESEUTIL will prove to be very helpful. In order to use this tool extensively and effectively, it is good to take a brief look at the way the Exchange database works. 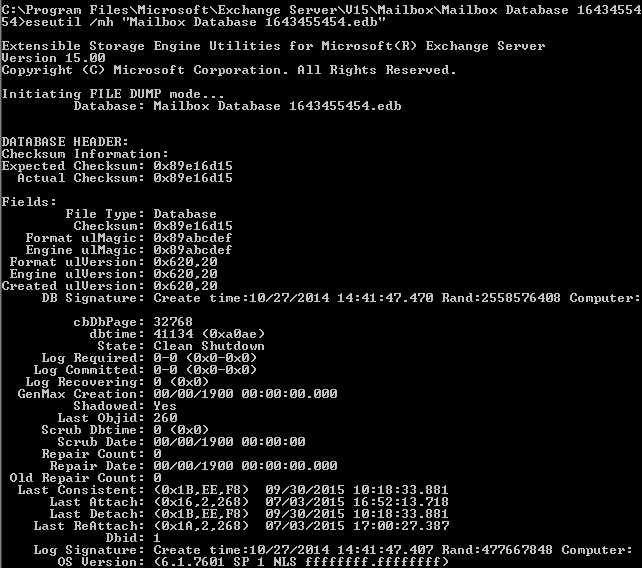 Mailbox Database.edb – this is the exchange database file. If you like, you can change its name and location by executing certain cmdlets in Exchange Management Shell. E00.log – this file holds transaction logs that reflect actions performed in the server’s memory. The example of such a transaction can be a situation when a new directory or message is created. E000000001F.log, E000000001E.log – these are the files that consist of archive transactions that are already accepted and added to the database. They are necessary in data recovery scenarios. E00.chk – a checkpoint file. It is used by the Exchange server to maintain a relation between the information included in the database and in the logs. E00res00001.jrs, E00res00002.jrs – these files are created along with logs of archive transactions and they are used by Exchange when disk space becomes full. E00tmp.log – it is a temporary file which is used at the moment when a new log file E00.log is created. Below you can see the screenshot that depicts already mentioned files. 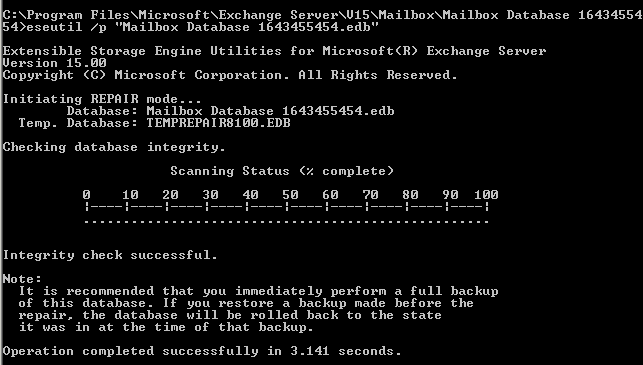 All the information processed by the Exchange server is automatically recorded onto the E00.log file. If this file goes over 1024 KB in size then another file is created – the new file is named according to this pattern: <original name> <hexadecimal number>. For instance, let’s assume that your E00.log file size reaches almost 1024 KB. When it happens, the E00tmp.log file is created and the content from E00.log goes to the file named: E000000001.log. 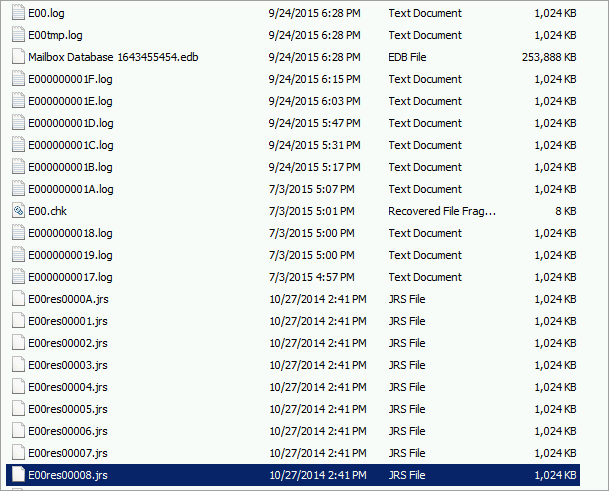 If the E00.log is about to exceed its size again another file is created, named E000000002.log, and so on. In Exchange, those sequence numbers are named IGeneration. Thanks to this database mechanism, you are able to retrieve all data even in case of physical server damage, providing the hard disks have remained untouched. In most cases, thanks to the log files, the Exchange itself (after the reboot) is able to get back to the state from before the failure. Of course, some rare situations may arise in which the server is not able to retrieve the previous state and the admin’s help is required. Important! Before you start working on your database with the ESEUTIL tool, make sure that you have created a backup copy of database files as well as all log files. Defragmentation is a process in which the database is reorganized in order to reduce its fragmentation level and create the database anew – in as much contiguous way as possible to improve its performance and reading speed. In this case, you can see that the database holds 247.9 MB including 83.81 MB of free space. In order to regain those 83 MB, you need to use the ESEUTIL tool to perform the process of defragmentation. It means that we need 180.5 MB of free space to complete the task. This, however, may turn to be bothersome as you perhaps already lack of free space as you have decided to start the defragmentation process. Fortunately, you can use an UNC path to store the temporary file used in defragmentation. The effectiveness of the process is about 45 GB per hour so it is good to estimate how much time you will need to complete the process in your case. Run the ESEUTIL tool and /d and /t switches – /t switch indicates the temporary path. Now the database is ready to be mounted back. After executing this commend you should see that the database takes up less space. You can also check the size of the .edb file. A temporary database file is created and it is given a random name. ESEUTIL copies the data from the old database to the temporary one omitting free space. Once all data has been transferred to the new database, the old database is deleted. The temporary database name is changed to the original one – from before the defragmentation process. After defrag is complete, you need to make sure you have created a full backup of database as it will not match the previous backup (the database has a new structure now). Defragmentation should not be performed on databases connected within DAG. If it is preformed, a new GUID of the database is created which means that the Exchange will see it as a completely new object. In such a case, the best way is to create a new database and migrate users’ mailboxes to it. Important! The database needs to be in the offline mode (dismounted). The result of this cmdlet is presented above. You can see that there is much information about the database. Despite the one pretty obvious such as the date of creation, you can also find important information about the state of the database file – in the screenshot above it is displayed as “Clean Shutdown”. This piece of information means that there is no incompatibility between the information in log file and the database. Here you can also find the information on so-called DB Signatures which indicates the database signature already mentioned in the previous section of this article. In the screenshot above, it is displayed after the word Rand. Additional important information is carried by the Log Signature header which points to the last log signature. In the example above, the signature number is 477667848. The header called Log Required tell us which log files are required to start the database. In our case, the value shows 0-0 which suggests that everything is fine and no file is required. However, in the case when the database had been stopped unexpectedly, this value could be, e.g. 34-37, which means that we need the following range of log files E000000034-37.log in order to start the database. Now, let’s examine the headers of the remaining files. 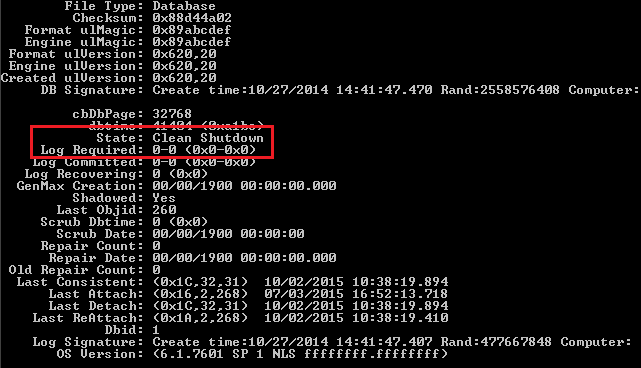 To do that, you can use the cmdlet below to see what is included in the main Exchange log file – E00.log. In the screenshot above, you can see lGeneration number, which represents a sequential log number to be used in the future – in the example above, it is E000000001C.log. You can also notice that next to the Signatures header, there is the following number displayed: 477667848 – the same that was found in the database file. 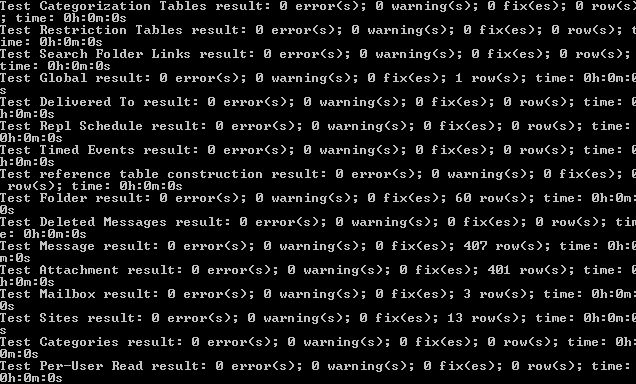 This suggests that this log file belongs to the previous database. 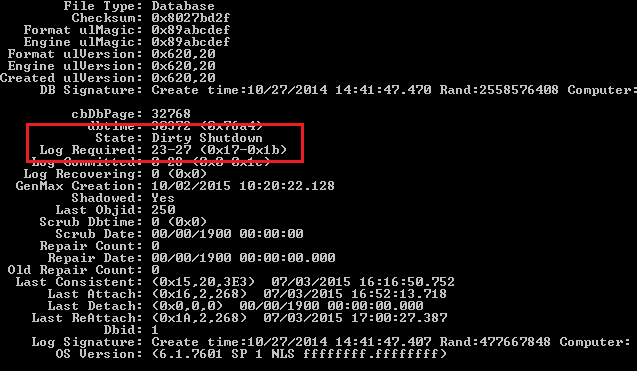 As you can see, the sequence consists of only two logs: E00.log and E000000001B.log. The additional information provided is that they do not generate any problems at this moment. One of the important pieces of information that you can find here is the name of the last checkpoint – the file that has been already added to the database. In this case, it is 1C which refers to the file E00.log that will become a log file named E000000001C.log. Of course, what is always significant is the signature that point to the log file which corresponds with the E00.chk file. Important! Before you start working on your database with the ESEUTIL tool make sure that you have all files from the database catalogue backed up and safe. As you can see, the Dirty Shutdown state has been reported. In the next line, there is the Log Required header which informs about the necessary log files. According to the screenshot above, the missing log files are from 23 to 27 (in the hexadecimal format 23 stands for 17 and 27 stands for 1b so the missing log files are from E0000000017.log to E000000001B.log). Those logs are required to recover the database without data loss. After this cmdlet being executed, the missing logs will be restored to the database. Now, it is good to check the state of our database one more time. It is strongly advised against using this type of database recovery as it may cause data loss and make it difficult to predict how much data may be lost. This the reason why the hard recovery should be used only as the last resort when there is no other alternative to recover the database. Database repair with ESEUTIL and the /P switch. Defragmentation of the database and its reconstruction with the /D switch. Index repair within the database with the IsInteg tool. Then, you need to defragment the database – the instruction on how to perform defragmentation has been already discussed in this article. 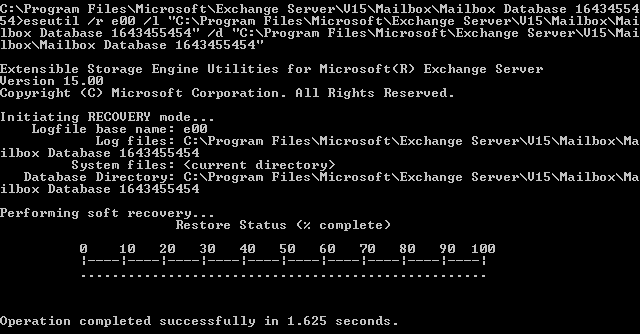 The final stage is to use the IsInteg tool (not available since Exchange 2010 SP1 – replaced with New-MailboxRepairRequest). IsInteg, in comparison to ESEUTIL, repairs the database in a more sophisticated level, e.g. it repairs mailboxes or folders. This command can be repeated as many times as it is necessary to get rid of all errors. Once the repair has been finished, you are ready to mount the database. Despite the fact that ESEUTIL can be considered rather an aged tool, it still widely used among administrators working with the Exchange server. Nevertheless, its future seems to be rather gloomy as there are new generation solutions such as New-MailboxRepaiRequest replacing the Isinteg tool (since Exchange 2010 SP1).